Watershed of Alibis: "Come on Down!" Well, we all knew that Bob Barker's retirement would spell "face lift" for the favorite game show of senior citizens everywhere, and some of us were even optimistic that his replacement would bring it a timely shot in the arm for the younger audience as well. But after watching 3 or 4 episodes with Drew Carey as the new host, I've abandoned my optimism for the singular thought, "What in the world was the network thinking?" He is simply a terrible host for this show. 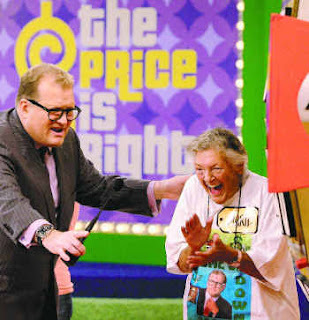 If you're ever home around 11:00am on a weekday, watch Drew Carey on The Price is Right and tell me if he doesn't appear to be mocking the whole experience- the show, the contestants, and even his coveted new position as host. There's no passion. No joyful lift in his voice when the wheel starts spinning toward "$1.00." Not even a smile or enthusiastic wave when Rod (or whoever it is now) says, "A new Carrrr!" None of that. Just a smug look that says, "That's right, I just got a massive pay raise to watch these idiots win toaster ovens and bedroom sets for an hour every day." If you've seen the show recently, tell me if you feel the same sense of abandonment from father Bob, or if you disagree with me entirely. Maybe I'm being too hard on the guy, I don't know. yeah, i agree... he doesn't care about the show at all. just the paycheck. I actually have yet to observe the Drew Carey Era. I will though after reading this blog. Thanks Ryan. (Enter sparkling tooth grin here). Although Bob was a textbook host (non descript, nicely pressed suit, partless silver hair, feigned enthusiasm) wasn't he always groping the Barker Beauties backstage? I just remember always seeing a tabloid article a couple times a year that would reference this. (Yes, I am taking tabloid info as totally accurate). (I love parentheses).